Home blue eyes brown eyes contact lenses eye color green eyes grey eyes heterochromia melanin These events can change your eye colour | Number 5 will shock you. These events can change your eye colour | Number 5 will shock you. 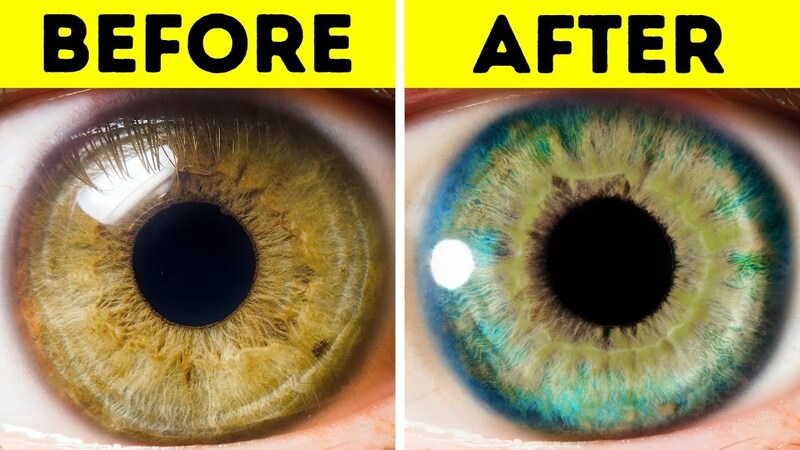 These events can change your eye color | Number 5 will shock you. Now you might assume that the color of your eyes is something you have no control over and that it's all genetic. But have you ever wondered, why your eyes look a bit lighter on a sunny day, or why the eyes of people who are in a rage seem to go dark all of a sudden? Yep, your eye color can change depending not only on the lighting or your mood but a whole slew of other factors. Now before we embark on our colorful topic, be sure to subscribe to our blog. If a baby was born with greyish blue eyes? Don't be surprised if they end up with a different eye color later on. Blue eyes are a result of a low melanin content in the irises. Causing them to reflect more light versus absorbing it. This phenomenon in the eyes is called the Tyndall effect. And it's kind of like Rayleigh scattering, which is what makes the sky appear blue. Next time a toddler asks you why the sky is blue? There's your answer. Now the eye color of babies from 3 to 18 months old can become darker. If the number of melanocytes in their irises increases. Depending on how much more melanin develops. A blue-eyed baby can end up with green hazel or brown eyes. The darker they get, the more melanin has appeared in their irises over time. In fact, the final eye color sometimes isn't even fully established until the age of 12. On the other hand, babies who were born with brown eyes experienced no changes. And they maintain that eye color for the rest of their lives. Due to a high content of melanin, the outer layer of the iris absorbs more light instead of reflecting it. Resulting in that beautiful brown color. So you see, it's a lot more complicated than just genetics and your parent's eye color. The color of your eyes may also change due to an injury or accident. According to Dr. Ivan Schwab, a clinical spokesman for the American Academy of Ophthalmology, head or eye trauma can result in a condition called heterochromia. Which is when a person's eyes have two different colors. Of course, it can be genetic. But heterochromia also happens when the melanocytes in your eye are shaken after a traumatic event. This trauma to the melanin in the eye can transform the iris to a lighter or darker shade. When the heterochromia is the result of injury, it requires immediate medical attention. Dr. Schwab says that it can also be a symptom of an illness such as Horner's syndrome, pigmentary glaucoma, or late-stage diabetes. Yep, your heart rate breathing and blood pressure change when you experience emotions like happiness, sadness, or anger. Most of us are familiar with our body's physical response to emotional stimuli. But still it was proven in a study conducted by the University of Arizona, what you might not be aware of is that your emotions also affect your eye color. The pigments in your iris compress or spread apart, making them darker or lighter, when the size of your pupil changes, your pupils, in turn, can get bigger or smaller depending on your emotional state. Remember how people who are really mad seem to have darker eyes? Well, this is why. These dilations in the pupil are the same reason why your eyes may look lighter or darker in different lighting. The pupils become smaller in bright light making your irises appear lighter and vice-versa in dim lighting. #4. Raw food diet and detoxing. Now there's a theory and alternative medicine that the color of the irises and the health of the internal organs are connected is called iridology. However, there isn't a lot of scientific proof backing it up, so it still needs further research. Dr. Robert Morris, a natural health and detox expert, with over 42 years of experience says otherwise. He believes that the inner portion of your eye, is connected with a digestive system and that by eating plenty of fruits and vegetables you can actually change the color of your eyes. Dr. Mooris explains, that a high concentration of yellow hues signifies a large number of toxins. But he also explains that every person's pigment is unique and requires an individual analysis. But in general, Mooris recommends eating spinach to keep the eyes youthful and bright, honey to add warm hues, and seafood to make the color more intense. Other foods that can affect the color of your eyes are olive oil, onions, and nuts. Ooh, those almond colored eyes. Owner and founder of live love fruit, Carly Frazier, also stands by Morris's theory. She went raw vegan for six years and saw for herself how her clean diet changed her eye color. She wants dark green eyes with brown specks turned light green blue with green flecks. She didn't just see a visible change in the color of her irises. She also managed to improve the work of her digestive system. And saw that the whites of her eyes became clearer and brighter as well. If you're doubtful about the whole iridology thing? Then try this quick trick. Instead, when it comes to bringing out certain pigments in your eyes, makeup and clothing can truly work miracles. For example, if you have brown eyes and want to make them look lighter, go for eyeshadows or tops that are gold pink or green. As for you, blue eye green eyed babes, you can reinforce the intensity of your eye color with the use of turquoise, emerald, and blue. Now if you have hazel eyes? You can make them look more Brown with the help of purple or more on the green side if you wear a burnt orange you. Neutrals like white, gray, and black can help underline your natural eye color. If you wear glasses ask your eye doctor to make your lenses with AR-coating. Not only does it neutralize glare, but it also enhances the color of your eyes. #6. Laser lightening of the eye color. Now beware, invasive eye surgery is very risky and can even result in blindness. Dr. Gregg Homer's innovative and way less invasive eye color correcting laser surgery doesn't come with so much risk. The procedure involves using a laser to destroy melanin cells and the irises, making them appear lighter. So people with brown eyes can have blue or grey eyes. The whole thing only takes 20 seconds to do. And the final results become visible within two to four weeks. His research shows that the operation doesn't affect vision whatsoever. But it's still relatively new and still needs further analysis of any potential side effects. Of course, the quickest way to change your eye color is to pop in some colored or decorative lenses. But which one is right for you? According to the American Academy of Ophthalmology, a colored contact lenses tended and can correct vision. Decorative lenses are for cosmetic purposes only and don't correct vision. You can go for natural eye colors or even get creative with a lot of different prints like cat eyes, spiderwebs, white outs, black scleras, creepers, and Smileys. Just be extra careful with decorative contacts because they can lead to serious eye problems. If you're planning to buy so, you need a prescription and they should be FDA-approved and medically safe. The US Food and Drug Administration prohibits purchasing from unauthorized sellers like street vendors, boutiques, flea markets, novelty stores, convenience stores, and online shops. Dr. Bernard Lepri, an FDA optometrist, says: that contacts without a prescription may result in corneal ulcers or blindness. Boy that's a high price to pay huh! So do you want to change your eye color? or are you happy with what you've got? Let us know in the comments below.